Special Containment Procedures: As the objects do not separately present lethal characteristics to subjects, they do not require any extreme containment measures. All tests preformed with SCP-ES-099 are to be preformed in the chamber in which it is currently contained. SCP-ES-099-1 is to be sealed in a 10 x 10 m room. The piano keys of SCP-ES-099-1 must be kept locked away. SCP-ES-099-2 should be stored inside of a folder, itself inside a safe in Investigator Landon's office. SCP-ES-099-3 is to be kept within a frame in Researcher Mallea's office. It is forbidden to use SCP-ES-099-3 for cleaning purposes. 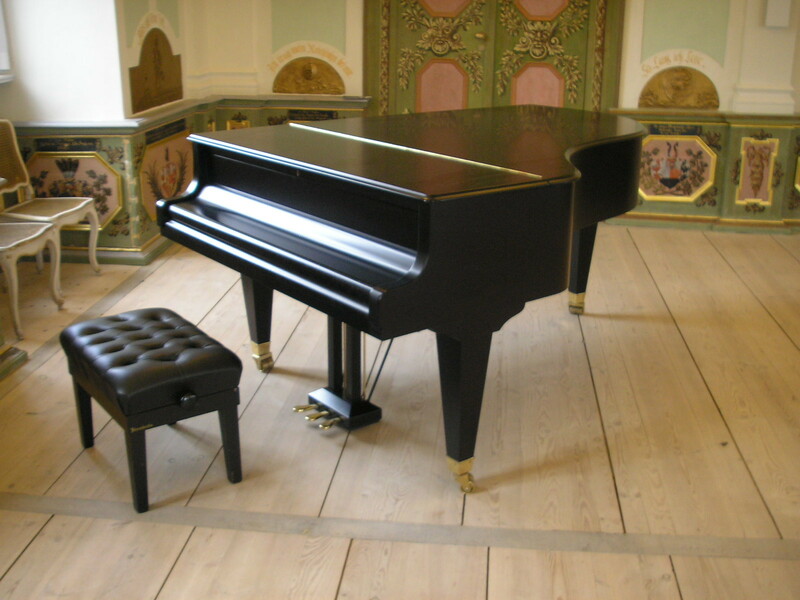 Description: SCP-ES-099-1 is a black grand piano constructed of oak wood. The keys of SCP-ES-099-1 are decorated with small reliefs depicting small stylized clouds on the white keys and representations of fire on the black keys. When SCP-ES-099-1 is used, the person playing will enter a state of relaxation or great euphoria, depending on the rhythm of the music being playing. It has been observed that SCP-ES-099-1 releases small flashes of red or blue color while playing SCP-ES-099-02. The subjects will not remember having entered the aforementioned states, nor will they recall having observed these flashes. SCP-ES-099-2 is a musical score titled "The Pianist's Redemption" which lasts approximately five (5) minutes. SCP-ES-099-2 contains a series of twisted notes that are physically impossible to play by a single subject. The material that was used to write the notes is a mixture of common Chinese ink and red wine. Tests have been conducted to determine the minimum number of subjects needed to complete the entire piece without any omission, but unfortunately, all subjects used showed a type of temporary amnesia that causes them to lose the ability to use a piano. SCP-ES-099-3 is a wine red cashmere suit, with buttons plated in 24-carat gold and a red rose in the outer pocket of the coat. SCP-ES-099-3 can be worn by any person regardless of height or size and provides greater ease in the use of musical instruments, especially key instruments. All three objects date back to the 19th century, yet are in perfect condition, with no trace of wear or damage. The main anomalous effect of SCP-ES-099 occurs when a subject wearing SCP-ES-099-3 attempts to play SCP-ES-099-2 on SCP-ES-099-1. The subject is compelled to play the complete piece despite physical impossibilities, often inflicting great damage. 0:00 – 1:20 The subject plays with great energy. These first minutes show nothing out of the ordinary and can be interpreted by a common pianist. 1:21 – 2:00 The subject's face changes to an expression of anger, almost hitting the keys. This fragment can only be interpreted by a professional pianist. 2:01 – 3:10 Once again the subject's face changes, this time to a face of suffering - this will continue until the end of the play. This part is impossible to perform in a non-anomalous context due to the great reaction speed required and the sheer number of notes - almost 120 notes are played between 2:54 and 2:55, for instance. 3:11 – 3:21 The subject's fingers begin to suffer first degree burns, apparently due to heat produced by the friction of playing the notes so fast. In these few seconds, more than 500 notes are played. 3:22 – 4:01 SCP-ES-099-1 cracks into several parts. SCP-ES-099-2 emits small sparks and radiates heat. The subject moves in the opposite direction to the piano while screaming for help, still playing. At this point, the tips of the subject's fingers will have third-degree burns. The piece is still not physically playable. 4:02 – 4:50 SCP-ES-099-1 radiates a white glow while a chorus can be heard from its interior. At the same time, the cracks extend throughout the object. SCP-ES-099-2 burns without being consumed. The rose that is present in the pocket of SCP-ES-099-3 begins to decay. The subject straightens up while continuing to ask for help. 4:51 – 5:00 The melody stops abruptly and all the objects return to their normal state. The music resumes again at a normal pace and ends. The subject stops asking for help and plays the last notes. It can be observed at this time that their fingers and wrists are dislocated or broken. Ladies and gentlemen, The Pianist's Redemption of Ronald L████, performed by (name of the subject). Thank you very much for joining me, and good night. Having said that, the subject will collapse, commonly suffering fatal cardiac arrest. Surviving subjects will invariably be left with a huge phobia of pianos, along with symptoms of paranoia and psychosis. Addendum 1: An old diary has been found at the old house of Ronald L████, behind a trap door. Only a few fragments have been deciphered, as all the pages are in very poor condition.